Wrapping up this segment I took a stroll over to Showtime. Californication has a typical QA flash piece at areyouhellasexy.com, but it's executed nicely. After you answer each question (they're multiple choice) it gives you a clip from the show that features one of the answers in the scene. One nerdy note..the box seen above that holds the clips moves about a little on a Z-axis, and the video will skew along with it. Just slightly mind you, but nicely done nonetheless. 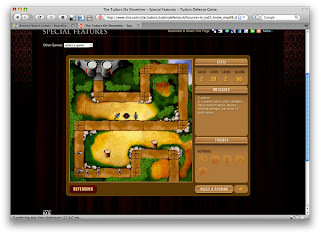 The only connection between the game and the show is...cannons and archers maybe? Would be more fun if you were defending against the zombie horde of Henry's dead wives. Apparently Photo-hunts are in this fall. 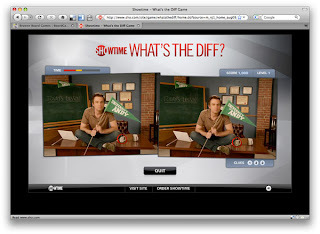 Showtime has a whole Flash experience that features most of it's shows in a Photo Hunt game. This one seems better put together than the one for Crash, and harder. Good soundtrack too.